How Much Has Link Building Changed in Recent Years? I get asked this question a lot. It’s mainly asked by people who are considering buying my link building book and want to know whether it’s still up to date. This is understandable given that the first edition was published in February 2013 and our industry has a deserved reputation for always changing. I find myself giving the same answer, even though I’ve been asked it probably dozens of times in the last two years—”not that much”. I don’t think this is solely due to the book itself standing the test of time, although I’ll happily take a bit of credit for that 🙂 I think it’s more a sign of our industry as a whole not changing as much as we’d like to think. I started to question myself and if I was right and honestly, it’s one of the reasons it has taken me over two years to release the second edition of the book. So I posed this question to a group of friends not so long ago, some via email and some via a Facebook group. I was expecting to be called out by many of them because my position was that in reality, it hasn’t actually changed that much. The thing is, many of them agreed and the conversations ended with a pretty long thread with lots of insights. In this post, I’d like to share some of them, share what my position is and talk about what actually has changed. Link building hasn’t changed as much we think it has. The core principles of link building haven’t changed. The signals around link building have changed, but mainly around new machine learning developments that have indirectly affected what we do. One thing that has definitely changed is the mindset of SEOs (and now clients) towards link building. I think the last big change to link building came in April 2012 when Penguin rolled out. This genuinely did change our industry and put to bed a few techniques that should never have worked so well in the first place. For me, the move towards user data driving search results + machine learning has been the biggest change we’ve seen in recent years and it’s still going. Let’s dive a bit deeper into all of this and I’ll talk about how this relates to link building. I think that most SEOs are coming round to the idea that you can’t get away with building low quality links any more, not if you want to build a sustainable, long-term business. Spammy link building still works in the short-term and I think it always will, but it’s much harder than it used to be to sustain websites that are built on spam. The approach is more “churn and burn” and spammers are happy to churn through lots of domains and just make a small profit on each one before moving onto another. For everyone else, it’s all about the long-term and not putting client websites at risk. This has led to many SEOs embracing different forms of link building and generally starting to use content as an asset when it comes to attracting links. A big part of me feels that it was actually Penguin in 2012 that drove the rise of content marketing amongst SEOs, but that’s a post for another day…! For today though, this goes some way towards explain the trend we see below. Slowly but surely, I’m seeing clients come to my company already knowing that low quality link building isn’t what they want. It’s taken a few years after Penguin for it to filter down to client / business owner level, but it’s definitely happening. This is a good thing but unfortunately, the main reason for this is that most of them have been burnt in the past by SEO companies who have built low quality links without giving thought to building good quality ones too. The thing is, I don’t think this was by choice. Let’s be honest. A lot of us used the kind of link building tactics that Google no longer like because they worked. I don’t think many SEOs were under the illusion that it was genuinely high quality stuff, but it worked and it was far less risky to do than it is today. Unless you were super-spammy, the low-quality links just worked. Fast forward to a post-Penguin world, things are far more risky. For me, it’s because of this that we see the trends like the above. As an industry, we had the easiest link building methods taken away from us and we’re left with fewer options. One of the main options is content marketing which, if you do it right, can lead to good quality links and importantly, the types of links you won’t be removing in the future. Get it wrong and you’ll lose budget and lose the trust if your boss or client in the power of content when it comes to link building. There are still plenty of other methods to build links and sometimes we can forget this. Just look at this epic list from Jon Cooper. Even with this many tactics still available to us, it’s hard work. Way harder than it used to be. My summary here is that as an industry, our mindset has shifted but it certainly wasn’t a voluntary shift. If the tactics that Penguin targeted still worked today, we’d still be using them. “I don’t feel that techniques for acquiring links have changed that much. You can either earn them through content and outreach or you can just buy them. 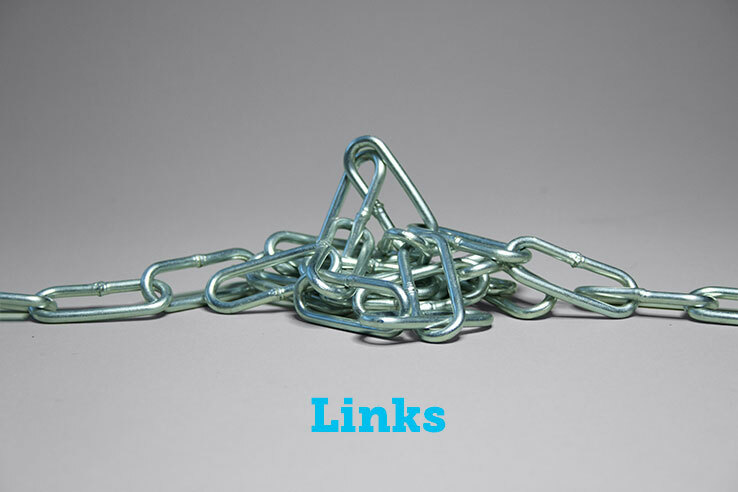 What has changed is the awareness of “link building” outside of the SEO community. This makes link building / content marketing much harder when pitching to journalists and even more difficult when pitching to bloggers. There is no question about this one in my mind. I actually wrote about this last year in my previous blog post where I talked about signals such as anchor text and deep links changing over time. Many of the people I asked felt the same, here are some quotes from them, split out by the types of signal. I’d agree with Phil here and this is what I was getting at in my previous post on how I feel “deep links” will matter less over time. It’s not just about domain level links here, it’s just as much about the additional signals available for Google to use (more on that later). I’ve never liked anchor text as a link signal. I mean, who actually uses exact match commercial keywords as anchor text on the web? Sure there will be natural links like this, but honestly, I struggle with the idea that it took Google so long to start turning down the dial on commercial anchor text as a ranking signal. They are starting to turn it down though, slowly but surely. Don’t get me wrong, it still matters and it still works. But like pure link spam, the barrier is a lot more lower now in terms what of constitutes too much. What I do struggle with though, is that Google still haven’t figured this out and that short-term, commercial anchor text spam is still so effective. Even for a short burst of time. It isn’t just about established signals changing though, there are new signals too and I personally feel that this is where we’ve seen the most change in Google algorithms in recent years—going all the way back to Panda in 2011. It is a touch scary that Google was able to run machine learning against answers to questions like this and write an algorithm to predict the answers for any given page on the web. They have though and this was four years ago now. Since then, they’ve made various moves to utilize machine learning and AI to build out new products and improve their search results. For me, this was one of the biggest and went pretty unnoticed by our industry. Well, until Hummingbird came along I feel pretty sure that we have Ray Kurzweil to thank for at least some of that. Leading on from what Rand has said, it’s becoming more and more common to see search results that just don’t make sense if you look at the link metrics—but are a good result. For me, the move towards user data driving search results + machine learning advanced has been the biggest change we’ve seen in recent years and it’s still going. Edit: since drafting this post, Tom Anthony released this excellent blog post on his views on the future of search and the shift to data-driven results. I’d recommend reading that as it approaches this whole area from a different perspective and I feel that an off-shoot of what Tom is talking about is the impact on link building. You may be asking at this point, what does machine learning have to do with link building? Everything. Because as strong as links are as a ranking signal, Google want more signals and user signals are far, far harder to manipulate than established link signals. Yes it can be done—I’ve seen it happen. There have even been a few public tests done. But it’s very hard to scale and I’d venture a guess that only the top 1% of spammers are capable of doing it, let alone maintaining it for a long period of time. When I think about the process for manipulation here, I actually think we go a step beyond spammers towards hackers and more cut and dry illegal activity. For link building, this means that traditional methods of manipulating signals are going to become less and less effective as these user signals become stronger. For us as link builders, it means we can’t keep searching for that silver bullet or the next method of scaling link building just for an easy win. The fact is that scalable link building is always going to be at risk from penalization from Google—I don’t really want to live a life where I’m always worried about my clients being hit by the next update. Even if Google doesn’t catch up with a certain method, machine learning and user data mean that these methods may naturally become less effective and cost efficient over time. There are of course other things such as social signals that have come into play. I certainly don’t feel like these are a strong ranking factor yet, but with deals like this one between Google and Twitter being signed, I wouldn’t be surprised if that ever-growing dataset is used at some point in organic results. The one advantage that Twitter has over Google is it’s breaking news freshness. Twitter is still way quicker at breaking news than Google is—140 characters in a tweet is far quicker than Google News! Google know this which is why I feel they’ve pulled this partnership back into existence after a couple of years apart. This is the crux of everything for me. With all the changes listed above, the key is that the core principles around link building haven’t changed. I could even argue that Penguin didn’t change the core principles because the techniques that Penguin targeted should never have worked in the first place. I won’t argue this too much though because even Google advised website owners to build directory links at one time. You need to give someone a reason to link to you. Many won’t do it out of the goodness of their heart! One of the most effective ways to do this is to develop a content asset and use this as your reason to make people care. Once you’ve made someone care, they’re more likely to share the content or link to it from somewhere. I really dislike the stance that some marketers take when it comes to content promotion—build great content and links will come. No. Sorry but for the vast majority of us, that’s simply not true. The exceptions are people that sky dive from space or have huge existing audiences to leverage. Getting to this point is hard—but that’s kind of the point. There are various hacks you can use along the way but it will take time to get right. Leading on from the previous point. It takes time and hard work to get links to your content—the types of links that stand the test of time and you’re not going to be removing in 12 months time anyway! This means that you need to keep pushing content out and getting better each and every time. This isn’t to say you should just churn content out for the sake of it, far from it. 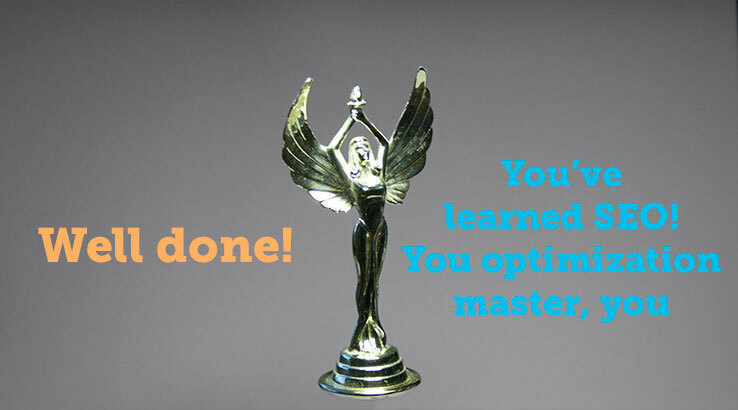 I am saying that with each piece of content you create, you will learn to do at least one thing better the next time. Try to give yourself the leverage to do this. Scalable link building is exactly what Google has been trying to crack down on for the last few years. Penguin was the biggest move and hit some of the most scalable tactics we had at our disposal. When you scale something, you often lose some level of quality, which is exactly what Google doesn’t want when it comes to links. If you’re still relying on tactics that could fall into the scalable category, I think you need to be very careful and just look at the trend in the types of links Google has been penalizing to understand why. To finish up, I want to briefly talk about the part that Google plays in all of this and shaping the future they want for the web. I’ve always tried to steer clear of arguments involving the idea that Google is actively pushing FUD into the community. I’ve preferred to concentrate more on things I can actually influence and change with my clients rather than what Google is telling us all to do. However, for the purposes of this post, I want to talk about it. “We are not publishing guest posts on SITE NAME any more. All previous guest posts are now deleted. For more information, see www.mattcutts.com/blog/guest-blogging/“. I’ve reworded this as to not reveal the name of the site, but you get the point. This is silly. Honestly, so silly. They are a good site, publish good content, and had good editorial standards. Yet they have ignored all of their own policies, hard work, and objectives to follow a blog post from Matt. I’m 100% confident that it wasn’t sites like this one that Matt was talking about in this blog post. I’m mostly joking here, but you see the point. The most recent infamous mobilegeddon update, discussed here by Dr. Pete is another example of Google pushing out messages that ultimately scared a lot of people into action. Although to be fair, I think that despite the apparent small impact so far, the broad message from Google is a very serious one. Because of this, I think we need to remember that Google does have their own agenda and many shareholders to keep happy. I’m not in the camp of believing everything that Google puts out is FUD, but I’m much more sensitive and questioning of the messages now than I’ve ever been. What do you think? I’d love to hear your feedback and thoughts in the comments. “Google is getting better at detecting location at a more granular level—even on the desktop. At that time, businesses located near town hall or a similar central hub appeared to be experiencing a ranking advantage. neither might be located anywhere near the city center. local search results in 2015 clearly indicate Google’s shift toward deeming the physical location of the desktop or mobile user a powerful factor in determining relevance. The relationship between where your customer is when he performs a search and where your business is physically located has never been more important. your hyperlocal information has become a powerful component of your business data. This post will teach you how to better serve your most local customers. If you do business in a small town with few competitors, ranking for your product/service + city terms is likely to cover most of your bases. The user-as-centroid phenomenon is most applicable in mid-to-large sized towns and cities with reasonable competition. I’ll be using two districts in San Francisco—Bernal Heights and North Beach—in these illustrations and we’ll be going on a hunt for pizza. just three enviable players in each district. These simple illustrations demonstrate Google’s increasing sensitivity to serving me nearby businesses offering what I want. can do to market your business as being highly relevant to your hyperlocal geography. We’ll break this down into four common business models to help get you thinking about planning content that serves your most local customers. Improving core pages of your website or creating new pages to include references to the proud part you play in the neighborhood scene. Talk about the history of your area and where you fit into that. Interview locals and ask them to share their memories about the neighborhood and what they like about living there. Showcase your participation in local events. Plan an event, contest or special for customers in your district. Take pictures, label them with hyperlocal terms, post them on your site and share them socially. Blog about local happenings that are relevant to you and your customers, such as a street market where you buy the tomatoes that top your pizzas or a local award you’ve won. Depending on your industry, there will be opportunities for hyperlocal content specific to your business. For example, a restaurant can make sure its menu is in crawlable text and can name some favorite dishes after the neighborhood—The Bernal Heights Special. Meanwhile, a spa in North Beach can create a hyperlocal name for a service—The North Beach Organic Spa Package. Not only does this show district pride, but customers may mention these products and services by name in their reviews, reinforcing your local connection. All that applies to the single location applies to you, too, but you’ve got to find a way to scale building out content for each neighborhood. If your resources are strong, build a local landing page for each of your locations, including basic optimization for the neighborhood name. Meanwhile, create blog categories for each neighborhood and rotate your efforts on a week by week basis. First week, blog about neighborhood A, next week, find something interesting to write about concerning neighborhood B. Over time, you’ll have developed a nice body of content proving your involvement in each district. If you’re short on resources, you’ll still want to build out a basic landing page for each of your stores in your city and make the very best effort you can to showcase your neighborhood pride on these pages. 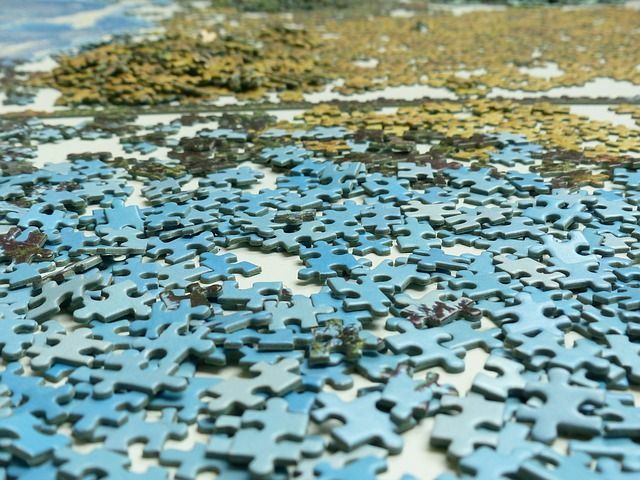 Again, scaling this is going to be key and how much you can do will depend upon your resources. The minimum requirement will be a landing page on the site for each physical location, with basic optimization for your neighborhood terms. Beyond this, you’ll be making a decision about how much hyperlocal content you can add to the site/blog for each district, or whether time can be utilized more effectively via off-site social outreach. If you’ve got lots of neighborhoods to cover in lots of different cities, designating a social representative for each store and giving him the keys to your profiles (after a training session in company policies) may make the most sense. 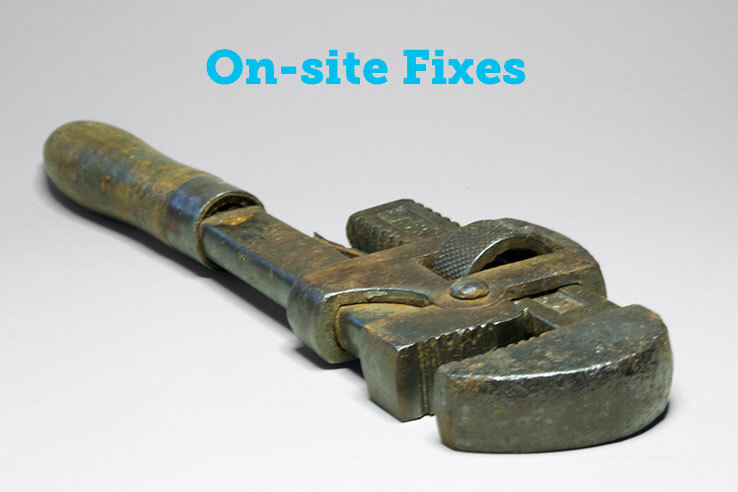 To be painstakingly honest, plumbers are going to have to be pretty ingenious to come up with a ton of engaging industry/neighborhood content and may be confined mainly to creating some decent service area landing pages that share a bit about their work in various neighborhoods. Other business models, like contractors, home staging firms and caterers should find it quite easy to talk about district architecture, curb appeal and events on a hyperlocal front. While your SAB is still unlikely to beat out a competitor with a physical location in a given neighborhood, you still have a chance to associate your business with that area of your town with well-planned content. Bernal Heights’ dog-friendly restaurants or does his rooftop view make his restaurant the most picturesque lunch spot in the district? If so, he’s got two new topics to write about, either on his basic landing pages or his blog. Whitespark’s favorite takeaways from Mike Ramsey’s LocalUp presentation, too. You get just one citation on each platform, unless you have multiple departments or practitioners. That means one Google+ Local page, one Yelp profile, one Best of the Web listing. etc. You do not get one citation for your city and another for your neighborhood. Very simple. As with the single location business, you are entitled to just one set of citations per physical location. That means one Google+ Local listing for your North Beach pizza place and another for your restaurant in Bernal Heights. Google no longer supports the use of modifiers in the business name field, so you can no longer be Tony’s Pizza – Bernal Heights, unless your restaurant is actually named this. You can only be Tony’s Pizza. Facebook’s policies are different than Google’s. To my understanding, Facebook won’t permit you to build more than one Facebook Place for the identical brand name. Thus, to comply with their guidelines, you must differentiate by using those neighborhood names or other modifiers. Given that this same rule applies to all of your competitors, this should not be seen as a danger to your NAP consistency, because apparently, no multi-location business creating Facebook Places will have 100% consistent NAP. The playing field is, then, even. The correct place to differentiate your businesses on all other platforms is in the address field. Google will understand that one of your branches is on A St. and the other is on B St. and will choose which one they feel is most relevant to the user. Google is not a fan of call centers. 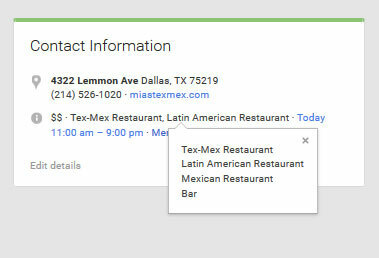 Unless it’s absolutely impossible to do so, use a unique local phone number for each physical location to prevent mix-ups on Google’s part, and use this number consistently across all web-based mentions of the business. Though you can’t put your neighborhood name in the title, you can definitely include it in the business description field most citation platforms provide. Link your citations to their respective local landing pages on your website, not to your homepage. Everything in business model #2 applies to you as well. 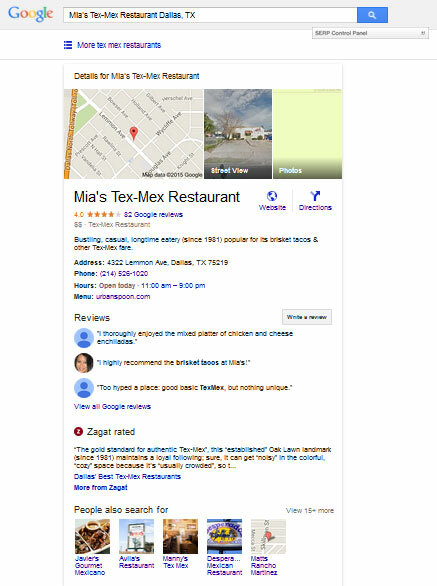 You are allowed one set of citations for each of your physical locations, and while you can’t modify your Google+ Local business name, you can mention your neighborhood in the description. Promote each location equally in all you do and then rely on Google to separate your locations for various users based on your addresses and phone numbers. You are exactly like business model #1 when it comes to citations, with the exception of needing to abide by Google’s rules about hiding your address if you don’t serve customers at your place of business. Don’t build out additional citations for neighborhoods you serve, other cities you serve or various service offerings. Just create one citation set. You should be fine mentioning some neighborhoods in your citation descriptions, but don’t go overboard on this. When it comes to review management, you’ll be managing unique sets of reviews for each of your physical locations. One method for preventing business owner burnout is to manage each location in rotation. One week, tend to owner responses for Business A. Do Business B the following week. In week three, ask for some reviews for Business A and do the same for B in week four. Vary the tasks and take your time unless faced with a sudden reputation crisis. Write about your neighborhood in the business description on your profile. Offer a neighborhood special to people who bring in a piece of mail with their address on it. Prepare a little handout for all-comers, highlighting a couple of review profiles where you’d love to hear how they liked the Bernal Heights special. Or, gather email addresses if possible and follow up via email shortly after the time of service. If your business model is one that permits you to name your goods or service packages, don’t forget the tip mentioned earlier about thinking hyperlocal when brainstorming names. Pretty cool if you can get your customers talking about how your “North Beach Artichoke Pizza” is the best pie in town! Check out this intro to social-local platforms here on Moz. Get inspired by this up-to-date article from StreetFight Mag, How Small Businesses Can Nail Social Marketing. Use Followerwonk to discover your nearest neighbors on Twitter. Remember that you are investigating each opportunity to see how it stacks up not just to promoting your location in your city, but in your neighborhood. 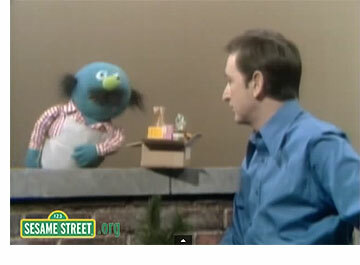 Remember that Sesame Street jingle? It hails from a time when urban dwellers strongly identified with a certain district of hometown. People were “from the neighborhood.” If my grandfather was a Mission District fella, maybe yours was from Chinatown. Now, we’re shifting in fascinating directions. Even as we’ve settled into telecommuting to jobs in distant states or countries, Amazon is offering one hour home delivery to our neighbors in Manhattan. Doctors are making house calls again! Any day now, I’m expecting a milkman to start making his rounds around here. Commerce has stretched to span the globe and now it’s zooming in to meet the needs of the family next door. If the big guys are setting their sights on near-instant services within your community, take note. You live in that community. You talk, face-to-face, with your neighbors every day and know the flavor of the local scene better than any remote competitor can right now. Now is the time to reinvigorate that old neighborhood pride in the way you’re visualizing your business, marketing it and personally communicating to customers that you’re right there for them. The post New for 2015: How-To Videos appeared first on Majestic Blog. This type of query underscores the need to track rankings on a local level. 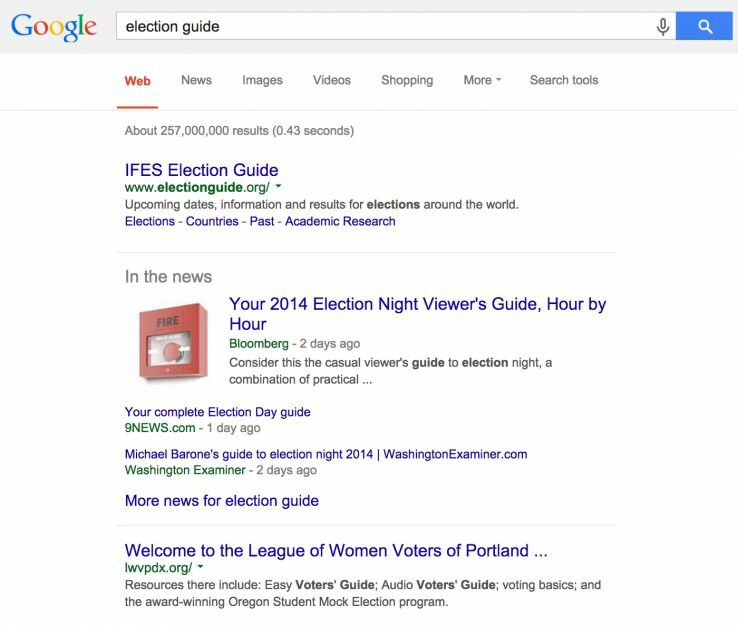 I’m searching for a non-localized keyword (“election guide”), but Google recognizes I’m searching from Portland, Oregon so they add the localization layer to the result. 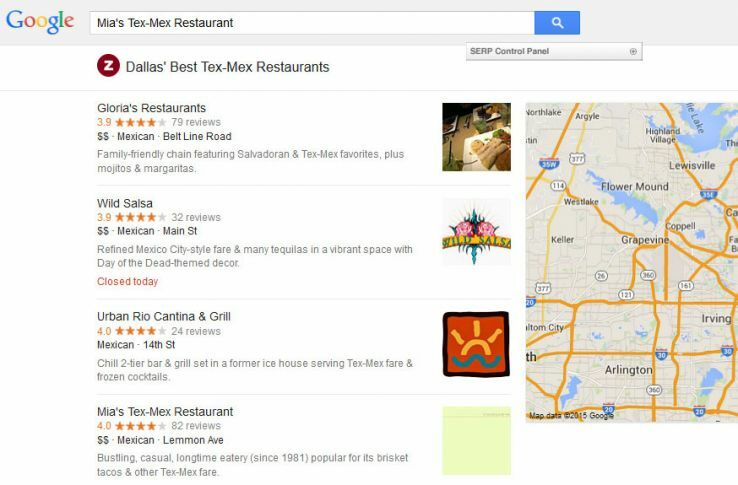 Improvements to ranking for local search results. [launch codename “Venice”] This improvement improves the triggering of Local Universal results by relying more on the ranking of our main search results as a signal. how to adjust for the Venice update remains one of the best strategic looks at the algorithm update. 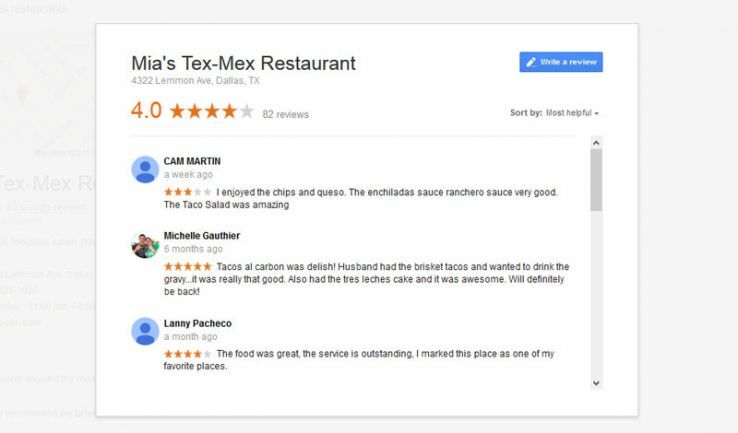 This jump in localized organic results has prompted both marketers and business owners to track rankings at the local level. An increasing number of Moz customers have been requesting the ability to add locations to their keywords since the 2012 Venice update, and this is likely due to Google expanding the queries which trigger a localized result. You asked for it, and today we’re delivering. Our new local rankings feature allows our customers to track keywords for any city, state, or ZIP/postal code. A keyword with a location specified counts against your keyword limit in Moz Analytics just like any other keyword. The local rankings feature allows you to enter your desired tracking location by city, state, neighborhood, and zip or postal code. We provide neighborhood-level granularity via dropdown for the United States, United Kingdom, Canada and Australia. The dropdown will also provide city-level listings for other countries. It’s also possible to enter a location of your choice not on the list in the text box. Fair warning: We cannot guarantee the accuracy of rankings in mythical locations like Westeros or Twin Peaks, or mythical spellings like Pordland or Los Andules. An easy way to get started with the new feature is to look at keywords you are already tracking, and find the ones that have an obvious local intent for searchers. 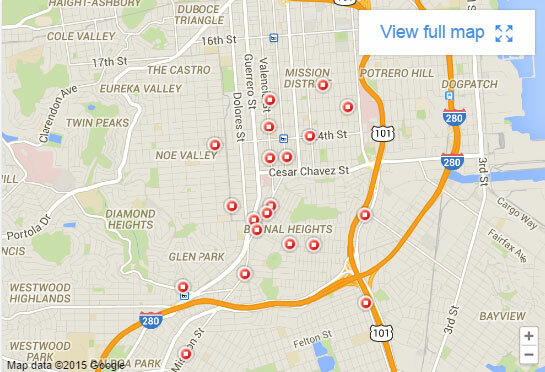 Then add the neighborhood or city you are targeting for the most qualified searchers. 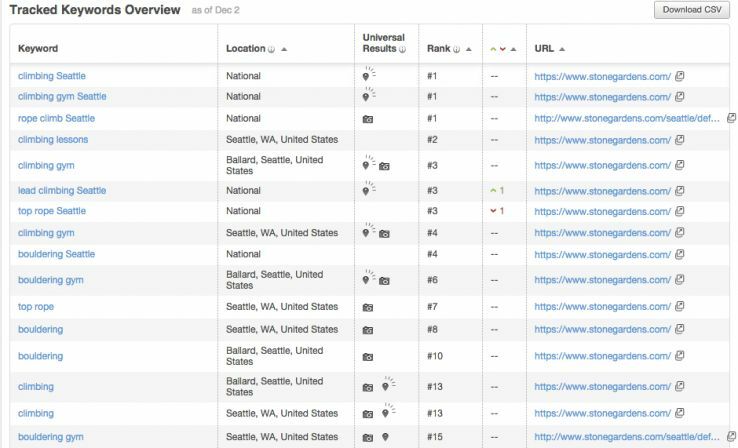 We will be launching local rankings functionality within the Moz Local application in the first part of 2015, which will provide needed visibility to folks who are mainly concerned with Local SEO. We’re also working on functionality to allow users to easily add geo-modifiers to their tracked keywords, so we can provide rankings for “health club Des Moines” alongside tracking rankings for “health clubs” in the 50301 zip code. Right now this feature works with all Google engines (we’ll be adding Bing and Yahoo! later). We’ll also be keeping tabs on Google’s advancements on the local front so we can provide our customers with the best data on their local visibility. Please let us know what you think in the comments below! Customer feedback, suggestions, and comments were instrumental into both the design and prioritization of this feature. SEO experts spend multiple hours a week reading blogs, social media and forums to stay abreast of the latest search engine developments; we spend even more time testing and measuring tactics to figure out what works best for our sites. When you spend so much of your time thinking, talking and learning about SEO, you can get lost in the echo chamber and take your eyes off the prize of growing your clients’ businesses. It’s easy to get excited about the new and shiny developments in search and to hang on Google’s latest announcements, but there’s no point in switching a site from HTTP to HTTPS if it doesn’t even have appropriately keyword-rich title tags. There’s no reason to run a button-color conversion rate optimization test on a site that’s still using the manufacturer’s default description on product pages. Sometimes your traffic is plummeting because you haven’t checked for new 404 errors in 6 months, not because you’ve been hit with a penalty. Think horses, not zebras, and don’t forget one important fact: Most people have no idea what we’re talking about. Running a business, especially a small business, is way more than a full-time job. Most business owners these days understand that they need to be doing something for their business online, but once they get beyond “have a website” they’re not sure of the next step. I was surprised by just how many businesses out there have never gone beyond that first step of having a website. The nitty-gritty of building a search-friendly website and driving traffic to it still aren’t that widely known, and without the time or inclination to become experts in marketing their websites, most small business owners just aren’t spending that much time thinking about it. Hanging out in the SEO echo chamber is a great way to stay on top of the latest trends in digital marketing. To win and keep our clients, however, we need to step out of that echo chamber and remember just how many website owners aren’t thinking about SEO at all. Relatively few people know or understand digital marketing, and that’s the reason we all have jobs (and most of us are hiring). The strapped-for-time aspect of business ownership means that once someone decides it’s time to get serious about marketing their business online, they’re likely to call in an expert rather than doing it themselves. It may not seem like much (or seem like kind of a no-brainer), but sometimes it’s all you need. 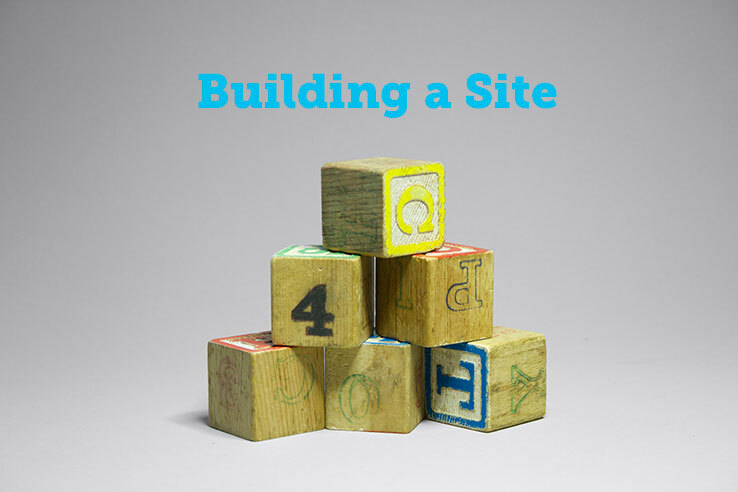 Of course, once the basics are in place, the smartest move is to keep improving your site and building authority; you can’t rely on your competitors not knowing their stuff forever. Even in more competitive markets, a shocking number of larger brands are paying little to no attention to best practices in search. Many businesses get the traffic and rankings they do from the power of their brands, which comes from more traditional marketing techniques and PR. These activities result in a fair amount of traffic (not to mention links and authority) on their own, but if they’re being done with no attention given to SEO, they’re wasting a huge opportunity. In the coming years, look for SEO-savvy brands to start capitalizing on this opportunity, leaving their competitors to play catch-up. Fast. Aim for an average page load time of under 5 seconds (user attention spans start running out after 2 seconds, but 5 is a nice achievable goal for most websites). Responsive so it can be viewed on a variety of screens. Mobile is never getting less important. Well-coded. The Moz Developer’s Cheat Sheet is as good a place to start as any. Easy to navigate (just as much for your customers as for Google). Run a Screaming Frog crawl to make sure a crawler can get to every page with a minimum of errors, dead ends, and duplicate content. Unique and keyword-rich, talking about what you have in the language people are using to search for it (in copy nobody else is using). Easy to share for when you’re building awareness and authority via social media and link building. So life is good and we are smart and there’s a lot to do and everything is very special. Good deal, right? SEO being a very specialized skill set has some serious downsides. 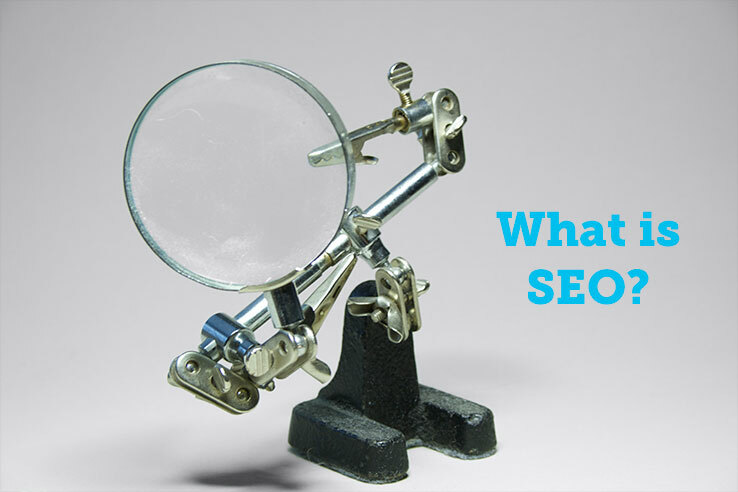 Most clients don’t know much about SEO, but some SEOs don’t know much about it either. 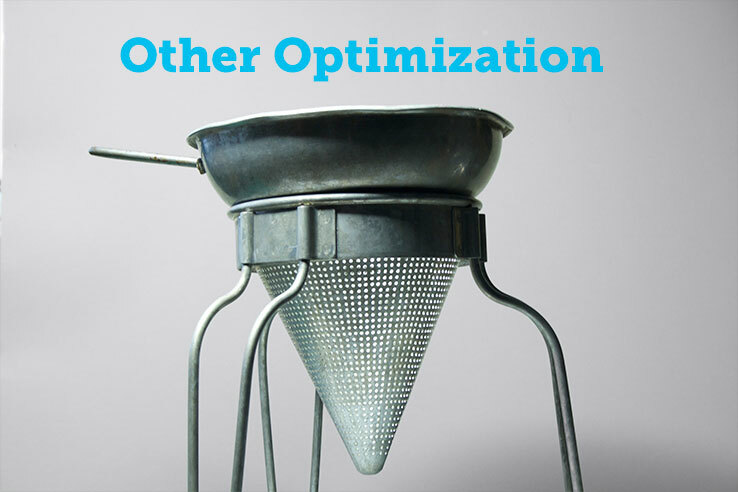 There are a ton of great resources out there to learn SEO (Moz and Distilled U come to mind). That said, the web can be a ghost town of old, outdated and inaccurate information, and it can be difficult for people who don’t have much experience in search marketing to know what info to trust. An article on how to make chocolate chip muffins from 2010 is still useful now; an article on PageRank sculpting from the same time period is much less so. Outdated techniques (especially around content creation and link building) can be really tempting for the novice digital marketer. There are a ton of “tricks” to quickly generate low-quality links and content that sound like great ideas when you’re hearing them for the first time. Content spinning, directory spam, link farms – they’re all still going on and there are gobs of information out there on how to do them. So why should we more experienced SEOs, who know what we’re doing and what works, care about these brand new baby n00b SEOs mowing through all this bad intel? bad marketing. It contributes to everything that’s spammy and terrible about the internet. It also makes us look bad. The “SEO is not spam” battle is still being fought. SEOs need to educate our clients and prospects on what we do and why we do it. That means giving them enough information to be able to weed out good tactics from bad even before we make the sale. It means saying “even if you don’t hire me to do this, please don’t hire someone who does X, Y or Z.” It means taking the time to explain why we don’t guarantee first-page rankings, and the risks inherent in link spam. Most of all, it means stepping out of the echo chamber and into the client’s shoes, remembering that basic tenets of digital marketing that may seem obvious to us are completely foreign to most website owners. At the very least we need to educate our clients to please, please not change the website without talking to us about it first! Since terrible SEO gives us a bad rep (and is annoying to fix), we also need to actively educate within the SEO community. Stepping out of the echo chamber in this case means we need to spend some time talking to new SEOs at conferences, instead of just talking to each other. Point brand new SEOs to the right resources to learn what we do, so they don’t ruin it for everybody – for heaven’s sake, stop calling them n00bs and leaving them to learn it all from questionable sources. As SEO content creators, we should also take time on a regular basis to either update or take down any outdated content on our own sites. This can be as simple as posting a notification that the info is outdated or as complex as creating a brand new resource on the same topic. If you’re getting organic search traffic to a page with outdated information, you’re passively hurting the state of SEO education. A declared stance on providing up-to-date information and continually curating your existing content to make it the highest quality? Sounds like a pretty strong brand position to me, SEO bloggers! Some people are going to read this post and say “well, duh.” If you read this post and thought it was basic (in every sense of the word), go out right now and fix some of your blog posts from 3 or 4 years ago to contain the latest info. I’ll wait. There are still a ton of markets where just the basics of SEO go a long way. Don’t get distracted by the latest developments in search if the basics aren’t in place. Brands that are getting by on their brand strength alone can be beaten by brand strength + SEO. Old/bad SEO information on the web means people are still learning and doing old/bad SEO, and we’re competing with them. Branding and positioning in SEO needs to take this into account. Clients don’t know who to trust or how to do SEO, so we have to educate them or we’ll lose them to shysters (plus it is the right thing to do). Bad SEO gives all of us a bad reputation, so education within our community is important too. How much traffic would I actually get if I rank on the first page? Is it worth my time trying to rank above the fold? How much more traffic will I get if I rank first in the organic results? I’ve been there, too. I felt overwhelmed and frustrated every time I had finally reached a number one organic ranking in Google only to find out that the traffic coming from the search engine was not making the big difference I was expecting. So I started searching for a way to find out how much organic traffic I could get for ranking on the top positions in Google. But I faced a big challenge. These days, with “not provided” being almost 100%, it’s very hard to measure how many people reach your website searching for a certain keyword. So I turned to the best source that I could get this data from, Google Webmaster Tools, which allowed me to see how many people click on my website when searching for the keywords I am interested in. This saved me a lot of time and allowed me to make better choices in the future with the keywords I was targeting. Sounds like something you would be interested in? Read on to find out more about how my initial findings turned out into a full fledged organic CTR study and how you can use this data to make better and more informed decisions in the future. TL;DR: This will be a long post, so for those of you who are anxious to see the results of this study, scroll down to the CTR Study section below. Alternatively, you can download the complete study in PDF format or check out the free Google CTR History tool we have built to aid with this study. AOL released more than 20 million search queries made by more than a half-million users in 2006.
followed after that, including those from Enquiro (now Mediative) in 2007 and later by Chitika and Optify in 2010. More recent studies have been performed by Slingshot in 2011 and then Chitika and Catalyst in 2013 respectively. It’s worth noting that the studies conducted by Mediative (former Enquiro) and Chitika, have been executed through unique methods that cannot be truly compared to any of the other studies. 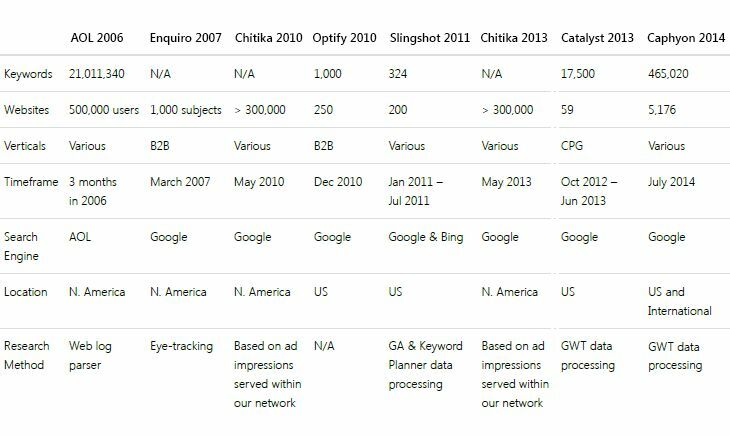 Mediative’s study relies on survey data and eye-tracking research, while Chitika’s studies are based on ad impressions served within their network. Optify defines CTR as “the percentage of users that clicked on each position, given that a user clicks on a top 20 organic ranking.” Their study makes the assumption that all searches result in a top 20 organic click. Google Webmaster Tools so comparing it with the Catalyst study would be the most accurate. So why a new study? First of all, the Google search results have evolved significantly since these studies were performed. Besides having a fresh set of data, we also wanted to make this study unique. This study is unique because we have segmented the queries to be able to see how the CTR is affected by different types of searches. For example, we have segmented the keywords by category (industry), search intent, number of words (long tail) and whether the keywords are part of a branded search or not. Another important section of this study is trying to find out what impact some features that appear in the SERP (such as ads) have on the organic results CTR. To make sure that we get relevant and accurate results, this study is based on search data coming from Google Webmaster Tools for 465.000 keywords and 5.000 websites. This study was intended to be as transparent as possible. Thus, we have included our step-by-step process below so you can see how we arrived at our results. More than that, we also decided to give away the entire set of data so you can do your own research. To protect our clients, the actual keywords have been anonymized in the data set. As we have seen with previous studies, the organic CTR changes in time due to various factors. It can be affected by the holiday season, or by more features that are constantly being added in the SERPs. This is why we decided to transform the initial study into a free tool that anyone can use to segment the data and watch how the CTR changes in time. Read on to see how different types of search results influence users’ behavior and what role the user intent has in determining the distribution of clicks. The initial data was obtained from Google Webmaster Tools (GWT) with the default filter: Web. This includes only traffic coming from non mobile devices. Our data set includes only keywords that have at least 50 impressions per month. We then changed this filter to Mobile and downloaded the table again to get CTR data for mobile devices. The Avg. position column from GWT displays an average of all ranking positions that this keyword has appeared in. This data was used to build the section of the charts. In GWT, when you click on a keyword in the Search Queries table, you will be sent to a report called Query Details. This report provides the CTR for each exact ranking position for that keyword. For example we can see here that every time this keyword was ranked first in the search results, the CTR was 56%. 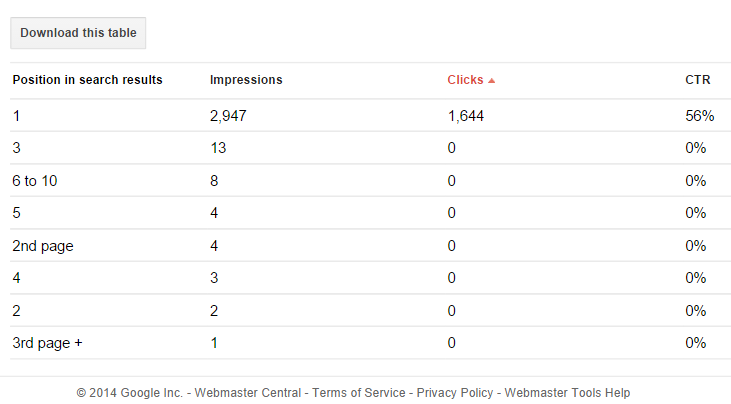 That’s because 2,947 people searched for it (Impressions) but only 1,644 people actually clicked on it (Clicks). This was done to ensure that we get accurate CTR results. A filter was also applied to include only the keywords that had at least 10 impressions per month for each exact position they appeared in. We wanted to see how the CTR changes for searches that contain branded keywords. Most brands rank first for their brand keywords and it is believed that people tend to click on that first result. For this study we have defined brand searches as searches that contain the entire domain name of the website in the query. The same thing happens when people include a search intent in their query. It is believed that people act differently when they are interested to buy something as opposed to looking for information about something or when comparing different things. How can we figure this out? We look for certain words in the search queries, trying to guess what the intent was for that search. This includes searches that contain words like: what, when, where, how, who, restaurant, hotel, flight, definition, define, review, news, weather, time, phone. This includes searches that contain words like: buy, purchase, order, shop, coupon, cheap, cheapest, expensive, pricing. This includes searches that contain words like: near, nearby, from, directions, how long to, how far away from, how fast, train station, airport, ferry, route, highway, toll, plane tickets, flights, maps, driving directions.We have also tracked long tail queries (more than one word) separately to see how they affect the CTR. 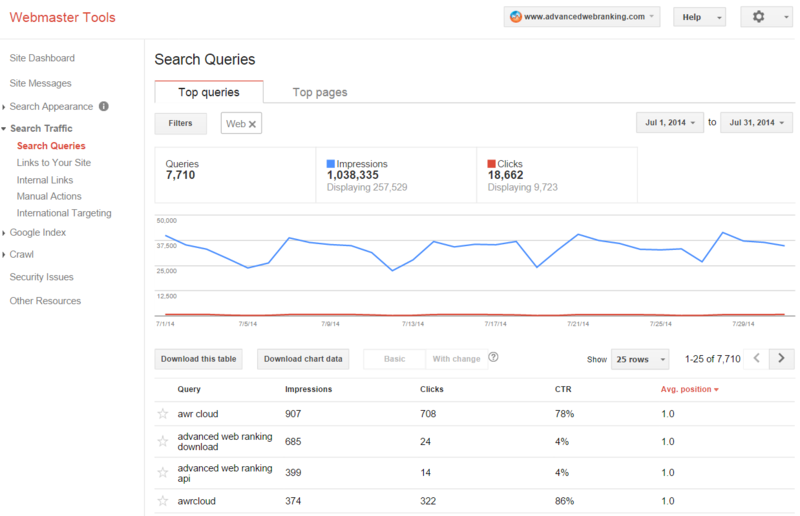 We matched the entire set of keywords from Google Webmaster Tools with the ones we track for each client in AWR Cloud. This way we were able to get more information about the features included in the SERP, such as the number of ads and their position and if any Universal features were included in the search results. We first used Excel to display this data in charts but in the end we ended up creating an in house tool because we realized that it would be interesting to see how the CTR changes over time. The sample data set that was extracted from GWT belongs to our clients. 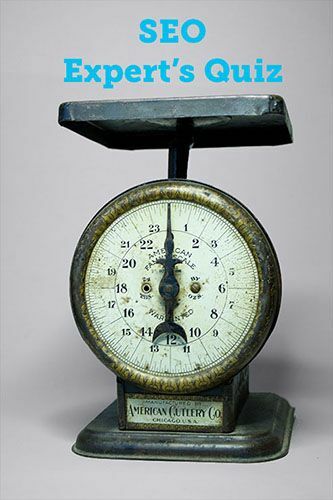 Their businesses, although variate, may belong to certain industries that are different than the industry you are in. Therefore the results may not be the same for every business. This study measures the CTR that was observed for a special time frame (within the month of July 2014). That means we cannot predict how the CTR changes for keywords that have higher volumes in different periods of the year. In this study, we also made the assumption that the data collected from GWT with the above methodology is accurate. This is the reference chart for the click-through rate (CTR) of organic desktop searches in Google for July, 2014. It is important to mention that these numbers reflect the CTR across all the searches included in this study. They do not account for the user intent, the features that appear in the SERP, or whether the keywords used in the search included a brand name. These will be addressed later in the study when we segment the data. On average, 71.33% of searches result in a page one organic click. Page two and three get only 5.59% of the clicks. On the first page alone, the first 5 results account for 67.60% of all the clicks and the results from 6 to 10 account for only 3.73%. Some people may find the ads displayed above the organic results more relevant. Some people may not find what they are looking for in the first 10 results so they click on results from the second or third page instead. Others may not find what they are looking for at all so they refine the search adding more words to the query to be more explicit. With Google providing more and more instant answers people may very well find the answer to what they are looking for in the displayed search results so there is no need for them to click on any of the results. Mobile traffic is getting bigger and bigger day by day. Here we can see the CTR for searches coming from mobile devices compared with the searches from desktop devices. Not only is the CTR slightly lower on the first page, but the CTR for mobile searches actually rises on the 2nd and 3rd page, which is opposite to what we would expect and see from mobile searches. One might assume that when users are making generic searches on Google, they end up making a brand selection from the results retrieved. They choose from the handful of options received, the source of information or provider to trust in for satisfying their need. branded searches are made? If the users are clearly looking for information related to a specific brand, will they follow the same behavioural pattern as for generic searches? For branded searches the first result is almost always associated with the brand’s website, which makes it the obvious choice for most users and very hard to miss. This would justify the big CTR difference between the first position and the rest of the SERP. This big difference in CTR may also be affected by the fact that brand searches usually display a pack of 6 site links just below the first result, making it more prominent in the search results. Most of us have some sort of intent when we search for something. We may need to find the location of a restaurant or a better price for that big TV we always wanted to get in the living room. It is believed that people who search for keywords with high commercial intent (“buy 4k LCD TV”) are more likely to click on the first results than people who perform basic informational searches (“where is the nearest thai restaurant”). Let’s see if search intent does indeed affect how people click on the results. This chart reveals that people tend to click more on the first results when their search has a specific intent. So we wanted to dig deeper and see which of the search intents affect the CTR and how. The “Specific Intent” in the chart above is the set of all keywords found in the Informational, Commercial and Location sections and the “Other Intent” means all the other keywords. Google is getting better and better at figuring out search intent. Nowadays, many of the search results contain instant answers so people no longer need to click on a website to find out what they’re looking for. The answer is already there. 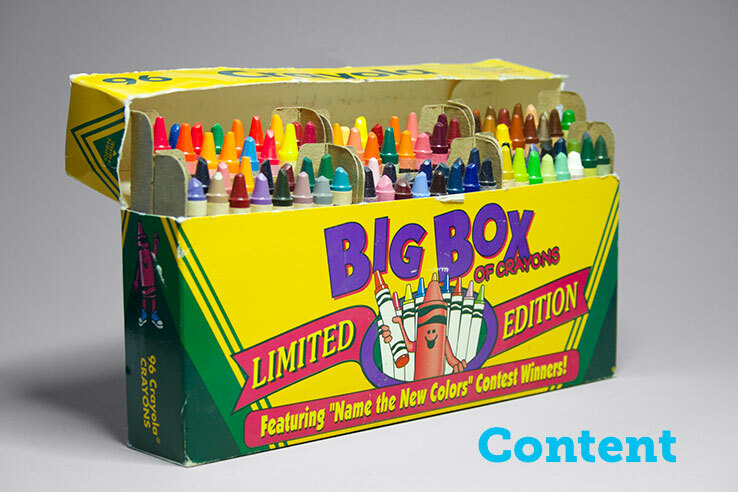 Commercial intent searches usually trigger ads that have colorful pictures of the products we search. It’s usually a lot more tempting to click on these pictures than on the first organic results. Remember the initial goal of this study? To find out how many organic visits one could receive for ranking in the top results on Google. We are now closer to reaching our goal. By knowing the CTR for each position in the organic search, we can now calculate the organic traffic potential of a website. Depending on the ranking of a keyword and how many people click on that website, we can easily calculate how many people would reach that website from organic search. But things get a little complicated when taking into account that each keyword is different. As this study showed, searches for branded keywords have a higher CTR. Search intent also affects organic CTR significantly and long tail keyword searches show higher CTRs for first page listings. where 24.8 is the CTR for the 1st position for unbranded keywords. Applying this formula for each keyword, enables you to estimate the amount of organic search traffic for any website. Where can you get this study from? complete Google Organic CTR Study in PDF format. You will also get access to the entire data set that we used for this study if you want to do your own research. free Google Organic CTR History tool, so make sure you check it out. The first thing we want to tackle next is how the features that appear in the Universal results (such as news, videos, places, etc.) affect the CTR. We will then dig deeper to see how the CTR is affected by carousels, answer boxes and other knowledge graph features that appear in the SERP. Is there something in particular you would like to see in further updates of this study? Post your comments below and let’s find out how we can improve this tool to benefit the entire community.